What if I told you that, you could shape and change your life by living in gratitude everyday? Most of us go through short periods (around the holidays, for example) when we feel grateful for what we have; however, when we learn to get into a space of gratitude with regard to all aspects of life, including the challenges, that is where the magic happens. With conscious and consistent practice, gratitude will become a part of the fabric of your life; it will become part of who you are. This is not just wishful thinking; in fact, there are scientific findings that practicing gratitude every day has positive effects on overall our wellbeing, personally and professionally. Emotional health. Gratitude strengthens our emotions. We become more resilient. We don’t get stuck in the energy of the bad things that happen, but instead learn to hold onto the good memories and let go of the bad. We experience more joy, less envy, and are generally more relaxed. Physical Health. We feel more alive. We have more energy and less stress. We have a better quality of sleep, less physical pain, and even stronger immune systems. This means less trips to the doctor! People who practice gratitude daily simply live longer and happier lives. Social Health. We are friendlier; we cultivate deeper relationships, have better marriages and healthier interactions with family. It has been proven that those who regularly practice gratitude by taking time to notice and reflect upon the things and people they're thankful for experience more positive emotions and express more compassion and kindness. Gratitude makes us nicer, more trustworthy. It helps us to connect with each other more fully and more authentically. Career/business. We have better management skills, increased focus and productivity, better decision-making skills and more efficient networking. We are more likely to reach our goals. Personality. Practicing gratitude makes us more optimistic and less materialistic. We have more self-esteem. It makes us more spiritual and connected to our Source. We will start to see the miracles all around us and see or hear the messages we are supposed to be receiving. With all those benefits, who wouldn't want to get into a regular feeling of gratitude? 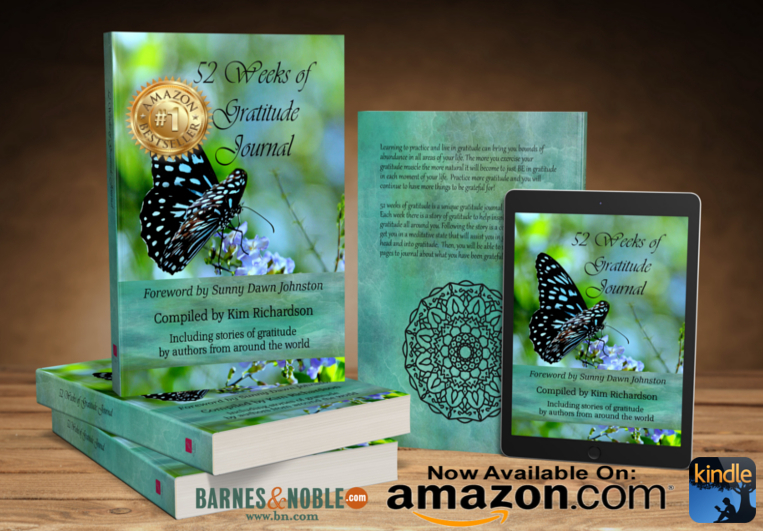 I have created a beautiful new book to help you create your own gratitude practice, the 52 Weeks of Gratitude Journal. This journal has 52 weeks, each starting with a story to help you get centered in gratitude. Following the story is a coloring page which helps you clear your mind and get ready to journal. Now, if you journal every week consistently for 52 weeks, you will have created a new routine of gratitude that will just become automatic. When you learn to look for the gratitude in every situation, even the most difficult ones, your live will change dramatically! You will create a life full of joy, love, and abundance all around you! We also created a beautiful gratitude card deck to support your gratitude journey. You can pull a card that will help you get centered in gratitude whenever you would like to. If you want to create, strengthen your gratitude practice or are looking for a beautiful gift then please check out my new 52 Weeks of Gratitude Journal and card deck. You can also find the print and eBook on Amazon. The print version is also at Barnes&Noble.com. On Dec 11, 2018 we will be celebrating the book launch on our FB Page - be join to join us and give the book a like! I am grateful for you! Thank you for sharing your journey with me.